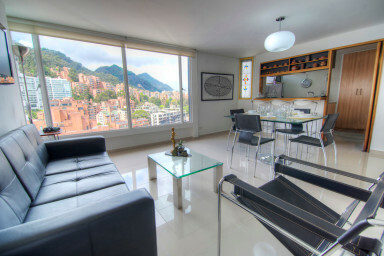 The apartment is located in the most exclusive neighborhood of Bogota (Rosales). Amazing mountain views (22nd floor)! This is a self-serviced apartment which will fit 2/3 guests comfortably. Guests will have access to everything seen in the pictures! Super-comfy double bed and a big Sofa. Building features: Elevator, laundry and 24 hour security. This apartment is located next to Bogota main street and Zona Rosa, in the most exclusive and safest neighborhood of Bogota (Rosales). Enjoy the views (22 floor). The apartment is located in Rosales (Carrera 7 y Calle 82), the most exclusive and safe neighbourhood in Bogotá. Close to the best nightlife, business area, and the best nightlife hotspot on the city, Zona Rosa, a definite favourite amongst visitors to Bogotá. Everything you need for a private, comfortable, convenient and affordable stay (Wi-Fi, fully equipped kitchen, TV). Excellent access to the shopping, restaurants, bars and clubs as well as all the major business area. Easy access to all parts of Bogotá.